The following is a private opinion (but, I believe, amply backed up by the Rules) from a USCF Tournament Director who happens to direct tournaments at the Boylston Chess Club. It is not necessarily the opinion of the Boylston Board of Directors, nor the Boylston CC Tournament Committee. This post is all me! The Digital Chess Clock - Embrace the Lack of Tick & Tock! The use of a chess clock in modern tournament play is as much a part of the game as Staunton chess pieces, how a Bishop moves, or "touch-move." You would not expect to play a tournament game with a set other than a Staunton design no matter how pretty it was. Bishops don't move along ranks & files. When you touch a piece, you have to move it. This is how you play a tournament game. You're expected to know how the pieces move and you would really look strangely at anyone, of any age, really, who was participating in a tournament who didn't know these things. The same thing has to be true of clocks and the rules involving their use. 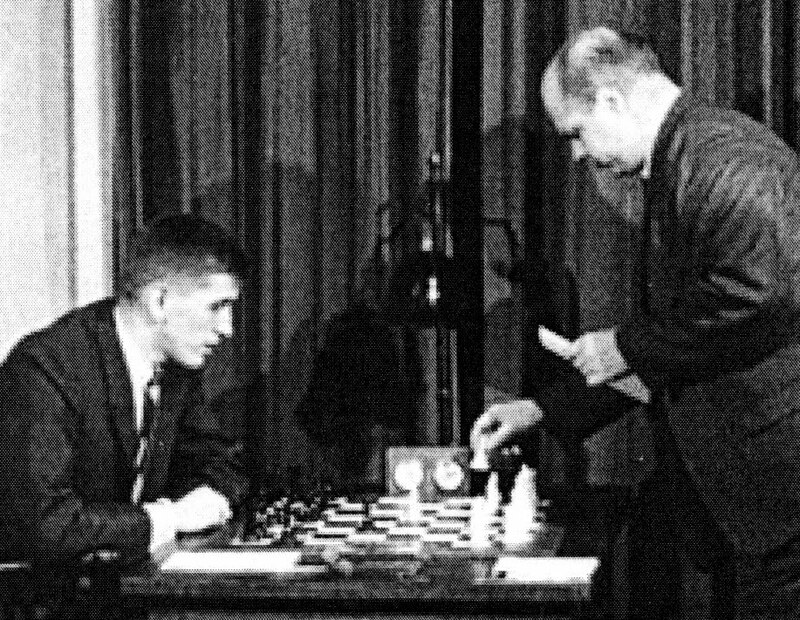 In the defense of some players, perhaps, the way a Bishop moves hasn't changed in the last 400 years or so, but rules involving clocks and time limits are much more fluid. Let's take a look at some of the more important rules involving clocks, especially digital clocks, in this day and age. 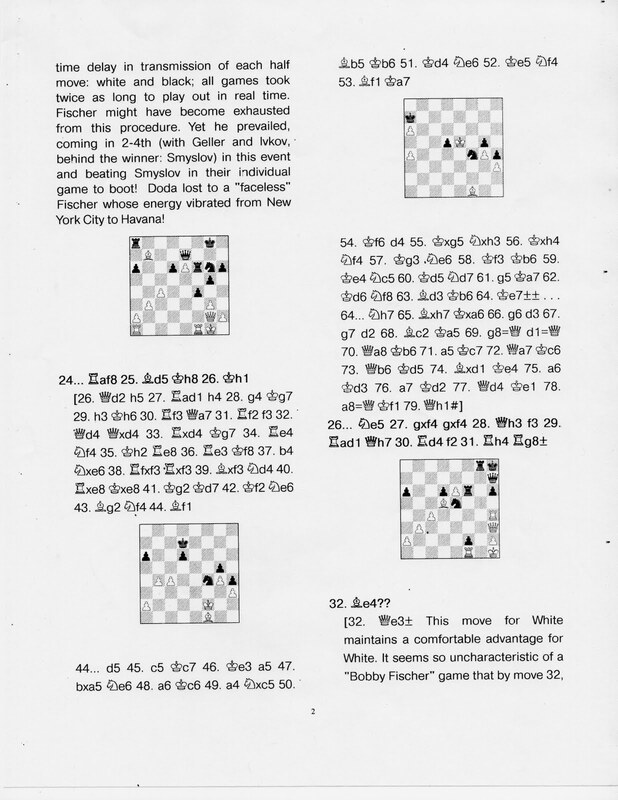 US Chess Federation's Official Rules of Chess, 5th Edition, as amended 5 May 2011: Rule 16Bb - Players are responsible for knowing how to set their own clocks. First of all - and this I consider the most important rule - it is the responsibility of the players to know how their clock works. It is not the responsibility of the Tournament Director to know how your clock works. It is critical that you know how to set your clock for various time controls. For most of our tournaments that's simple. We have Game/60d5 - one Sudden Death time control, 60 minutes per person for the whole game, each move delayed by 5 seconds. However for a slower tournament you may have multiple time controls like, 40/90, Game/20d10. Here the first 40 moves are made in 90 minutes, then you have 20 more minutes to complete the game. All moves give you a delay of 10 seconds. In this case, assuming the 40 moves are made on time, at the completion of the 40th move, you get 20 additional minutes on your clock in order to finish the game. The more expensive, newer clocks such as the Chronos and the DGT XL do this automatically. The older or inexpensive clocks, such as the DGT 2000 or the Saiteks, require you to do it manually. It is critical that you know how to do this before your game so you can do it quickly and efficiently when your 41st move comes up! Now, say your opponent makes an illegal move and you call him on it. The most common penalty an Arbiter can assess is to add two minutes on your clock - giving you two extra minutes - as compensation. (USCF Rules of Chess: 11D) (While a lot of us would like to just have the person who made the illegal move forfit the game, that's not how it works usually. :-) ) You will then need to know how to manipulate your clock so that you can add or subtract time from either clock face on the fly. Remember, if its your clock its your responsibility to know this, it is not the Arbiter's responsibility. If you cannot manipulate your clock the Arbiter may be forced to replace it with a clock that quickly can be properly manipulated in order to efficiently move the game forward. US Chess Federation's Official Rules of Chess, 5th Edition, as amended 5 May 2011: 42D - A properly set clock with time delay capability is preferable to any other clock in a game with any sudden death time control. Finally, it needs to be recognized that digital delay clocks are now the preferred default equipment for a tournament game. This means that if there is a choice of clock during a game, the digital clock gets the nod. This means that if Black, who gets choice of equipment, has an analog clock and White has a digital clock, White uses their clock, even though Black normally gets choice of equipment. The digital delay clock for tournament competition is here to stay and I think there are good reasons for them. It is now as standard as algebraic notation or even the Staunton Chess Set. Indeed, there has been serious discussion within the USCF of banning analog clocks from tournament play, something that I am against because I feel it would put an undo burden on clubs, such as ours, that still have an inventory of analog clocks. That being said, no tournament competitor should even consider for a nanosecond buying an analog clock these days, and clubs should replace their analog clocks, as they become worn out, with digital models. As a craftsman it behooves you to know how to use your tools. We all know how to use Bishops and Knights. We all know a few openings in order to start our games. Now, in this new digital age, we all need to review and know how to use one of our most basic tools - the clock. Before your next tournament, swap out that review session you planned on the Modern variation of the French Defense and go through your clock's manual (you do have your clock's manual, don't you?!) and review it. Parents! If your little warriors are at less than reading age (but still flattening middle-agers like me over the board!) it is your responsibility to either teach your child how to use their clock, or to know this yourself, and be on hand to assist your child if the Arbiter requests you do so. Time marches on, even for our venerable game of Chess. Your clock is as much a part of the game as your pieces. Take "time" to learn how to use it effectively! Boylston Chess Club is "Expanding" to South Station! Starting in October, the Boylston Chess Club will have several "reserved" tables at South Station, Boston. We will also have some space to store some chess boards, sets, clocks, and some fliers advertising our club. What we need are players! We are looking for a few volunteers to act as seeds a couple of times a week during lunch time (and early evening) in the first weeks of October. The only requirement will be to play chess! We'll provide sets and boards, and you can just sit and play chess-- what could be easier? Furthermore, to publicize our South Station presence, on October 20th, GM Larry Christiansen will be performing a 20 board simul right in the middle of South Station. Watch this space for future details on how to register for this event and what great prizes we will have. Volunteers who help us establish our October stamp in South Station will have priority for a seat in the simul. Please e-mail the club directly if you want to help us by playing chess in South Station at lunchtime. Even once a week, or twice a month, would be a great help. This Tuesday, September 27th, we are having another Chess960 tournament. If you haven't heard of Chess 960 / Fischer Random, it's a great variant, and a good way to build up tactical strength. 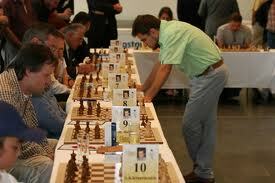 Many of the top players like to play Chess960. The event begins at 7, with registration starting at 6:15. Entry is $5 for members, $10 for non-members, with 60% of entry fees going to prizes. Format is round robin, pending turnout. No USCF membership required! 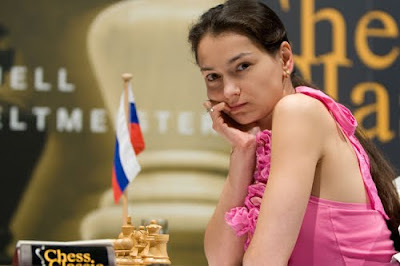 WGM Kosteniuk plays Chess960 (and is the Chess960 woman's world champion) -- why don't you? It is time to vote for a new Board of Directors! The annual members meeting is slated for 7:45 PM, Tuesday October 4th. If you are interested in voting for the new Board, or if you are interested in being ON the Board of Directors, please come to this meeting. We will try to vote promptly, as the new Board will have much new and old business to attend immediately after the vote. 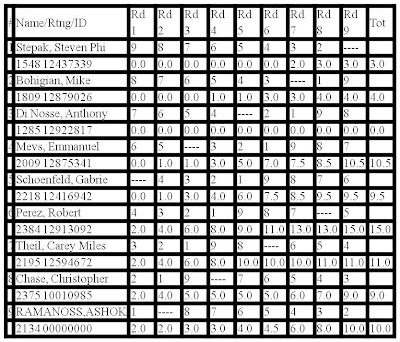 Boylston Chess Club newcomer Robert Perez (from Miami) has won the 2011 edition of our Blitz Championship, a strong event with 6 experts and masters. In this double round robin, Robert, rated 2384, ran away with 1st place by yielding only a single point. With 10.5 points, NM Carey Theil edged out expert Emmanuel Mevs for 2nd place. 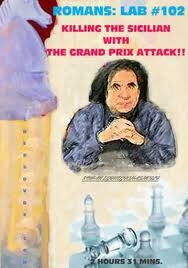 Grand Prix on Saturday, Sept 17th! Just a reminder that the cheapest chess in New England ($7.00 for members, $10.00 for non-members) is this Saturday at the Boylston Chess Club in Davis Square. Remember, the year end winners will have the choice of great prizes-- one year membership to the Boylston Chess Club, $100 cash, OR up to 8 free entries to BCC tournaments in 2012! The races have started to tighten up, as several leaders have been idle over the summer. The 2011 New England Open was my first "big tournament" in over 20 years, since I was a teenager. I thought about attending for a good while. Should I just skip it this year, stay at home and practice on the computer/study, or should I just say, the heck with it and attend? A colleague at work who has been a good inspiration in a number of ways over the last three years said, "Go for it. You'll probably get more out of the six rounds there than you will sitting at home on the computer for a month." So, with that attitude, I decided to go. With everything that had gone on with me over the past two months, I decided to make it something of a vacation. I'd stay at the hotel (something I'd almost never do), go in the hot tub...and play chess. I figured if I got 2/6 points I'd be happy. I lost every single game. I lost the 5th round to a very nice girl, Pooja, rated 528 who, in my defense, was having a wonderful tournament. She ended up garnering over 325 points to her rating. Coming into the U1500 crosstable at 18th out of 18 she left it 6th. Still, remembering that several years ago I could sneeze on 500 rated players and kill them, that defeat was particularly hard to take. Cassia seemed to be saying, You abandonned me for over 11 years, buddy. I'm not taking you back that easily! From a networking standpoint, however - usually not my strong suit - the New England Open was a wild success (depending on how you identify success, perhaps). The week before the New England Open, after I'd decided to go, I'd been looking at pictures of old and current international tournaments. We've all seen them: two big-name players battling it out over the board with their national flags by them. I'd always thought that looked neat. I thought, Why can't that be done at the state or local level? It would "class up" the game. So, I went out and got a flag stand and small state flags for every New England state, a US and Canada flag, and an extra MA flag. During my first actual round, I put out the flags for myself and my opponent. I got MA, and Scott Stapel got his NH flag. 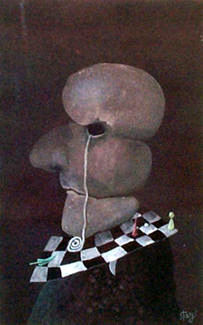 George Mirijanian, MA Chess Association President and the New England Open's Assistant Arbiter told me Monday, "Here we were starting Saturday mornning, and as I looked out at the sea of chessboards my eye was immediately drawn to yours and your flags. I'd been to a lot of big national tournaments - several US Opens, in fact - and I'd never seen that done. I thought, Here we're dealing with someone who thinks differently." Apparently I impressed George, although I had no idea how much. I was also, apparently, the only person taking photographs. I was doing it for personal reasons, just on my mobile, but it turns out that those photos are the only record of the 2011 New England Open. George was happy to have them. On Monday afternoon between Rounds 5 & 6 a meeting - the usual yearly meeting, apparently - for the New England Chess Association was held. I'd been googling NECA for a bit and could find absolutely nothing about it save for two broken links to a non-existent website on the Western MA Chess web page. Not being able to find out much about it, I asked George if the meeting was open to observers. He said, "Yes." So I went. To observe. Honest! NECA is the regional chess association. I'm finding out that a full understanding of chess poltics takes Ph.D.s in politics, sociology, and in some cases abnormal psychology (but that last is a prereq. for any study of politics!). NECA is made up of representatives of the New England State Chess Associations as well as six Delegates-at-Large. It's not a membership organization like the United States Chess Federation or the Massachusetts Chess Association. The meeting went quickly and quite reasonably well. Since, largely, the only people there were the people with an interest, or who were already representatives, the voting for the 2011/2012 Officers and Delegates went smoothly. Then we got to the Delegates-at-Large. All of a sudden George says, "I nominate Richard Kinne as a Delegate-at-Large." Hummmm. What? Wait a second! I stood up and explained that I was just there to observe. I wanted to find out more about the organization and how it fit into the maze of chess politics. Having me as a Delegate might be a bad idea because I had transportation challenges with no car. I couldn't get to meetings. "That's no problem," George said. "We have one meeting a year - here." "How are things done in the interim?" I asked. And so, suddenly, in a moment of great weakness (Hey! I'd just lost five chess games in a row, the last to a 528 strength player! I was still in massive shock! :-) ), I found myself saying, "Yes" and taking on the role of getting the New England Chess Association on the web. This Sunday, September 18th, the Boylston will be having its first ever Bughouse tournament. Bughouse, for those not familiar with it, is an exciting chess variant featuring teams of two players working in tandem. 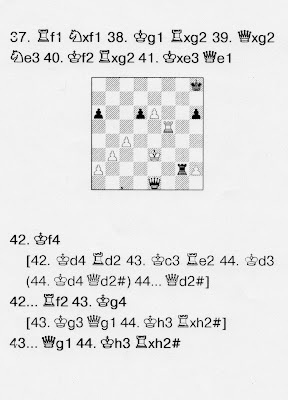 For more on the game, including the rules we will be using, you can visit http://chess.about.com/od/chessvariants/a/Bughouse.htm. Tournament registration begins at 11:00 A.M. You can come with a partner or solo, in which case we can try to find you a partner. At noon, we will briefly go over the rules of bughouse, and the tournament will start shortly thereafter. It will be over by 4:30 at the absolute latest. The format will be double round-robin. Entry is $5 per person. This should be a great, casual event. Creative team names and team uniforms are welcome. No USCF membership is required. Bring your friends! 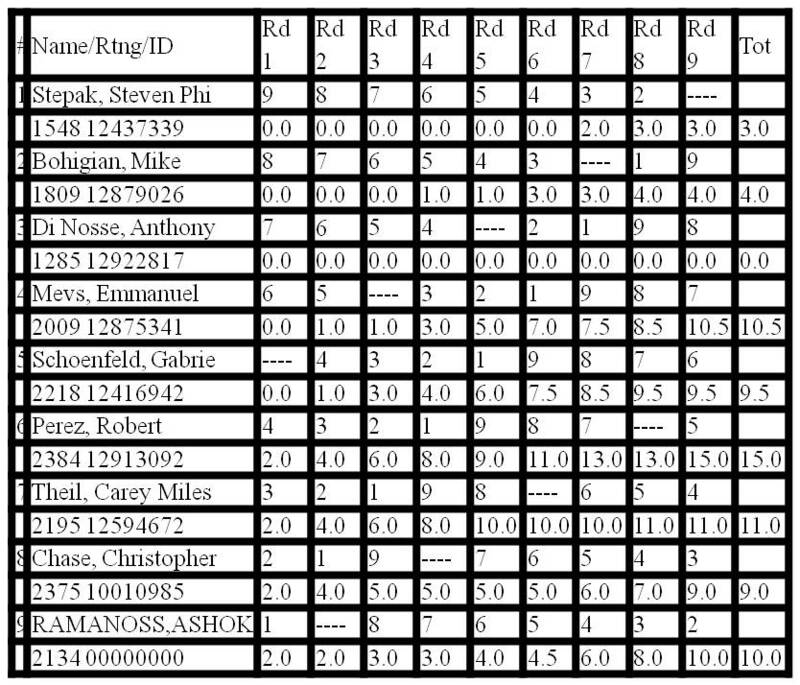 First of all, congratulations are in order for Mike Bohigian, who became the BCF's first Chess 960 tournament winner a little less than two weeks ago. Tomorrow, on Tuesday, September 13th, this exciting event returns, and we hope you will attend! If you haven't heard of Chess 960 / Fischer Random, it's a great variant, and a good way to build up tactical strength. 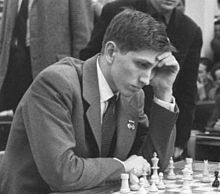 In the Boston Globe on September 10, Harold Dondis noted Marc Esserman's sensational Smith-Morra Gambit against Loek van Wely. 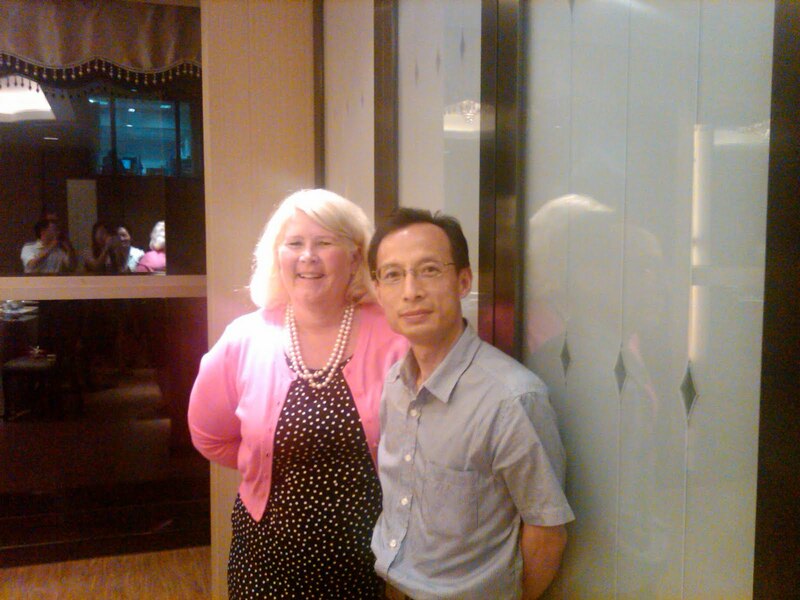 Albert Yuan sends his greetings. A friend and colleague of mine at BU, Kelly Walter, was visiting China last week and happened to meet Albert Yuan. Talk about a small world. He sent his greetings to me and all his friends at the Boylston. Who hasn't dreamed of being a referree? Being able to run on the pitch with the other players, wearing a special uniform? Being able to blow a whistle when things go wrong? Wait. Sorry. That's football. Look around the Bolyston Chess Club. Take a good look around and name me the one thing you see everywhere. Yes, you could answer the chess books of our rather extensive library (and, indeed, I might have to accept that answer) but the one I was going for was the "TDs WANTED" flyer that is seemingly on every bulletin board and door and wall in the club. I mean, you'd think they were serious or something! It is with those flyers in mind that I presented my newly-renewed Club Arbiter qualifications to Bernardo at a small lull during my first tournament last month and said, "I'd like to help." And thus was born a second beautiful mentorship! As I mentioned before, the first person to teach me tournament direction was Joe Ball in Syracuse, NY, decades ago and light years away. You didn't have to worry about cell phones. Anyone could beat a computer. There were no laptops. All the clocks were analog clocks. There were no such things as half-point byes. It certainly is a different world now! Introducing me into this different world 25 years later is our own Bernardo. I paired with cards 25 years ago. I don't think we even have cards at the club now. It's all done on the computer. And while there is a part of me that misses the cards, I have to admit that the computer gives you a very interesting flexibility, and the current chess scene seems to have taken advantage of that flexibility. Twenty-five years ago the option of half-point byes where you can request to not play a round for whatever reason and just take a half-point, didn't exist. 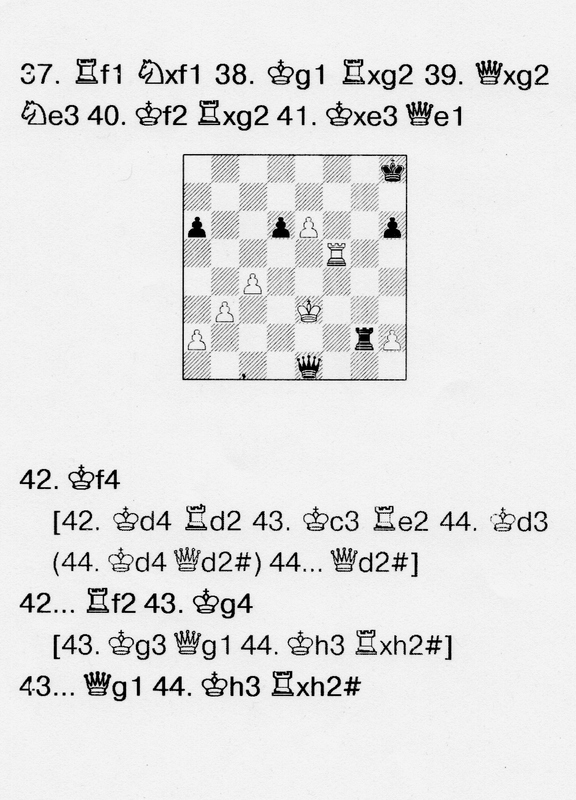 It really complicates the score groups in a Swiss System tournament. But, with the computer simplifying things such as this, half-point byes are quite common. 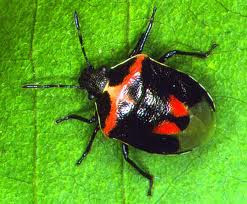 Whether they're a good idea or not may be the subject of a future article! One of my favorite aspects of computer pairings is the computer printing out the wall chart and pairings for you! And, honestly, when I direct, this aspect of computer pairings will be your favorite aspect as well - you won't have to decypher my writing! Digital Clocks: Chess Savior or TD Nemesis? You Decide! Do I have a nemesis as I'm reintroducing myself to tournament direction? Well, yes I do. Believe it or not my biggest challenge in this new age has been the digital clock. Specifically the Chronos Digital Clock. From mistakenly resetting Steven Stepak's clock at a tournament last month, to not even being able to figure out how to turn off Harold Dondis's clock after the first round of the September Thursday Night Swiss ended, every experience with the Chronos clocks have been an adventure. I'll probably have to sit down with an owner's manual sometime soon. Digital clocks as a class, I think, have revolutionized chess timing for the better, all things considered. But they certainly have complicated matters! 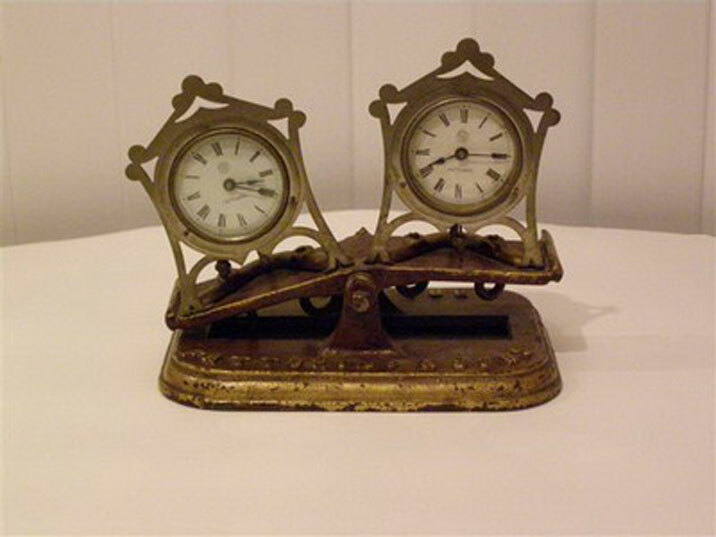 As limiting, perhaps, as analog clocks are, they certainly were simple - two dials, two wind-up keys, and two buttons. That was it. Now certainly the Chronos Digital Clocks are simple - three buttons across the top - but they're anything but simple or obvious, at least to me so far. So, this month, for the first time since 1992, I am the Chief Arbiter at a chess tournament - specifically our September Thursday Night Swiss. I can't imagine a better introduction! The Thursday Night Swiss, of course, is a tournament held one night a week for a month under Classic time controls. Once the round starts you have time to retype the financial record sheet, make sure about your money balance, etc. And you have time make sure everything is set up correctly for the eventual USCF ratings submission which takes place in three weeks instead of three hours. Due to these factors I'd certainly recommend the Thursday Night Swiss as an introduction to anyone who wants to direct. At the risk of jinxing myself (FM Chris Chase's comment: "The night is still young! "), the first round went swimmingly, so I look forward now to the rest of Thursday nights in September! Concurrent with the BCF Championship, the BCF Hauptturnier begins on Monday, September 12. BCF Championship and Hauptturnier - September 12, 19, 26, October 3, 10, 17, 24, November 7, 14 Games start at 7:00 PM. Also, some Thursdays for make-up games: September 22 & 29, October 20 & 27, November 3. Time Control: RR/30/90 G/45. 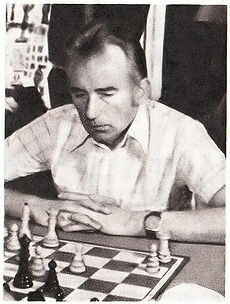 The Hauptturnier I believe was initiated by Bob Fuhro to provide a challenging event for the best club players who hadn't qualified for the Championship. After extensive discussion the board voted to limit the Hauptturnier to the 10 highest rated players who register. There is a signup sheet posted in the club - if you are interested please sign up and give your phone number and email address. If you can't make it to the club, you can email oresick@bu.edu or biglesia@bu.edu. If more than 10 players register, the lower rated players will play in a Swiss or Round Robin. Alex Cherniack and Bill Kelleher suggested the corresponding tournament would be for, ... what's the German word?... for patzers. So, if there is sufficient interest, we will sponsor the 2nd annual Patzerturnier. Last year we had 10 in the Hauptturnier and 9 in the Patzerturnier. 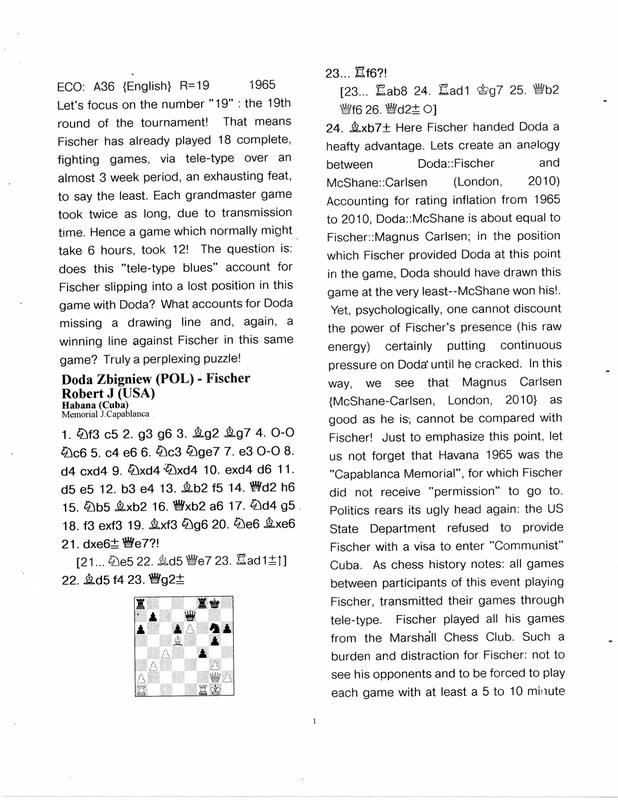 Steve Stepak discusses the game Doda versus Fischer at the Capablanca Memorial, Havana 1965. Did Doda miss a win? In case you missed it, Tuesday Night Blitz returned last week in a double round-robin tournament, with FM Bill Kelleher emerging triumphant, and chess master Gabriel Schoenfeld returning to the club for the first time since 1989! Tuesday Night Blitz tournaments will be held every other week for the next few months (alternating with Chess 960), and we invite you to join next week (on September 6th) for this exciting new BCF offering! Entry fee is $5 for members and $10 for non-members, with 60% of entry going to prizes. Registration is from 6:15 to 7:00, and the tournament starts at 7:00 P.M. The tournament will consist of 5 minute games without increment. We hope to see you there!